I am looking to install a water filter system and I wanted to test the water for free and total chlorine. The above product can measure free and total chlorine ( 0, 0.5, 1, 3, 5, 10 ) PPMs. I was surprised to find out after using these test strips that city supply has 0 PPM for both free and total chlorine. Questions 1. Any idea how I can test if these test strips are indeed working? 2. Anything wrong with the way I have tested? Test strips for chlorine should work for both chlorine- and chloramine-treated water. See Here-to-learn's comments to this answer for the chemical kinetic reason why chlorine test strips will also work for chloramine-treated water. Notice that your city supplies the water with chloramine. Depending on how much chloramine is present in your tap water, leaving water to sit for days on the countertop would be necessary to remove a significant amount of chloramine. 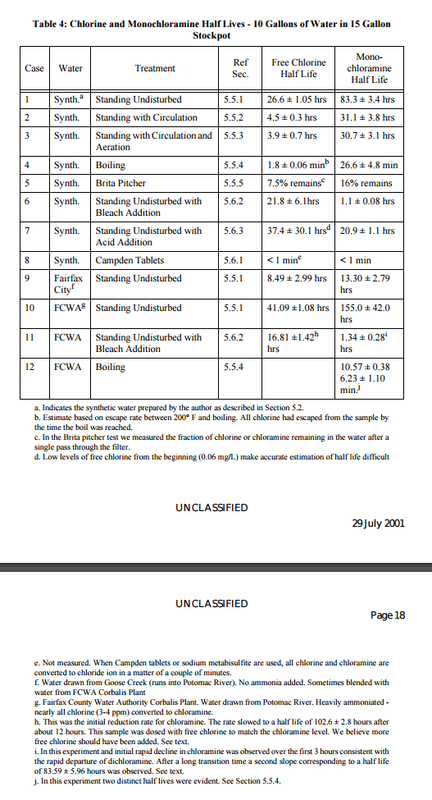 Page 17 estimates the half-lives of chlorine vs. chloramine. How to test for fluoride levels in drinking water? Sensitive test for lead in water? Conductivity of water and chlorine?